The immune cells douse the bacteria with a toxic cocktail that contains, among other things, chlorine bleach. This leads to the oxidation of proteins inside the bacterial cell within seconds, resulting in bacterial death. The researchers published their report in the journal E-Life from 6.3.2018. When bacteria enter the blood stream, neutrophil granulocytes, the most common white blood cells, are the first line of defence. They literally devour the invaders – a process that is referred to as phagocytosis. They engulf each bacterium and shower it with a toxic cocktail made up of so-called reactive oxygen species. Those include hydrogen peroxide, an ingredient of many antiseptic agents, and chlorine bleach. These substances destroy the molecules of the bacterium through oxidation – a chemical reaction, in which the oxidation states of atoms are changed. The details of this defence reaction are not fully understood: how and when are the bacteria doused with the poison cocktail? Does that only happen inside the immune cells? How long does the process take? Which enzymes of the immune cell are involved? "Once we'll find an answer to these questions, we will understand how some bacteria outwit our immune system and how the immune system is impaired by certain genetic defects," explains Lars Leichert. In order to gain detailed insights into the process, the team utilised fluorescent proteins that had been only recently developed. They contain an amino acid pair that is sensitive to chemical oxidation. Under blue light, these so-called roGFPs glow green. If the amino acid pair is oxidised, they glow under violet light, too. In their experiments, the group used Escherichia coli bacteria that contained artificial genes with the blueprint of roGFPs. The researchers brought these bacteria together with immune cells, which engulfed the bacteria just as expected. 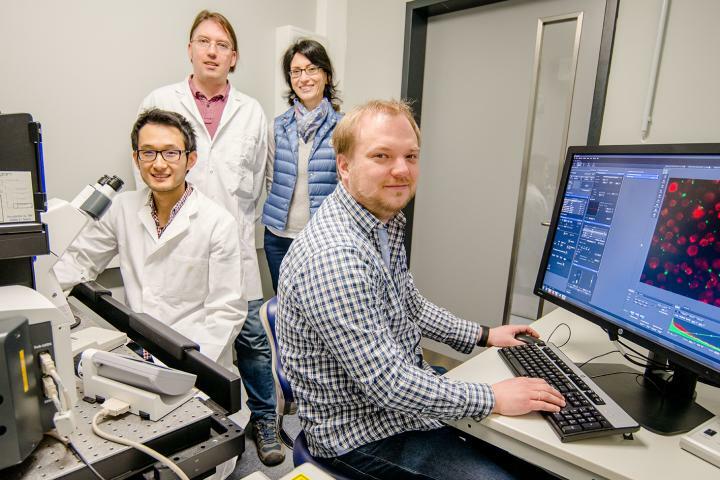 Under a super-resolution microscope, which was funded by the state of Northrhine-Westphalia and the German Research Foundation, the researchers observed that the roGFPs inside the bacteria glowed under blue light. Once they were fully devoured, the roGFPs oxidised within seconds and glowed under violet light, too. "Based on the speed and the specificity with which the roGFPs oxidised, we have deduced that chlorine bleach plays the key role in the process. That means: immune cells utilise bleach to kill bacteria," concludes Leichert. In order to identify the enzymes required by the immune cells for successfully mixing a deadly cocktail, the researchers experimented with cells lacking specific enzymes. They saw that cells that lack an active NOX2 enzyme were unable to destroy bacteria through oxidation. This enzyme is also missing in patients with a certain genetic disorder. Oxidation was also considerably less in immune cells where Myeloperoxidase was blocked, the enzyme necessary to generate chlorine bleach.